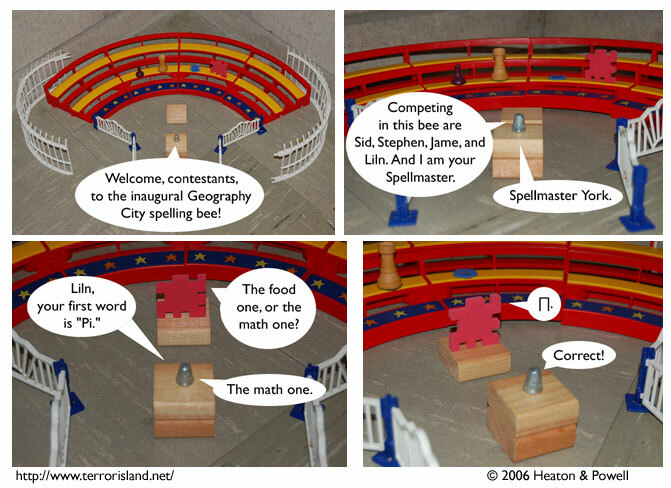 The set design here is based on what I imagine spelling bees are like in Geography City. That's why there's no audience apart from the contestants. York probably didn't even send out a press release. First and foremost: the San Diego Comic-Con ham scans are up. Infinite thanks to Kris Straub of Starslip Crisis for his assistance and bandwidth. And also to all the artists who participated. Welcome to anyone who has been linked here via Starslip or Fleen, or anywhere else for that matter. If you want to sample our wares, I recommend starting here. Terror Island is a gamepiece photocomic, telling the story of two roommates trying to decide whose turn it is to go get the groceries, while their friends variously help or hinder their grocery shopping related schemes. I am very very excited about this spelling bee storyline we just started, as well as the storylines coming up after it. Then again, I'm pretty excited about everything having to do with Terror Island, so, that's not really news. White Town's 'Your Woman' is exceptionally good, and a while after it came out, I completely forgot about it. I rediscovered it from my friend Dennis's music collection, and then again when the video was linked from some forums I hang out on. So I figured I'd share it with you all. Also, you should all ask Ben about the book I got him for his birthday. It's about fonts and morality.